PREVIOUS: Lucy and Larry, Male: Taylor. Blair and Thunder, I like those names! I hope they have a successful year. 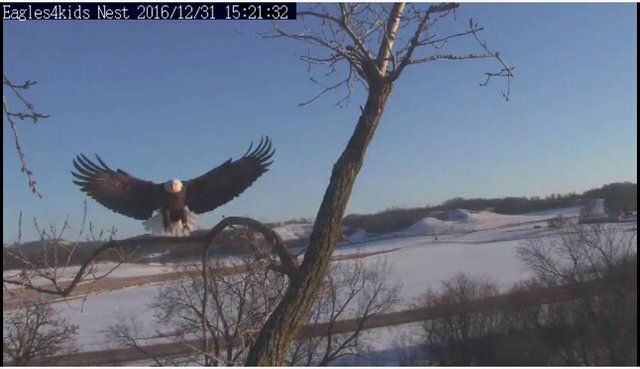 Thunder appears older - perhaps he can fend off other eagles. 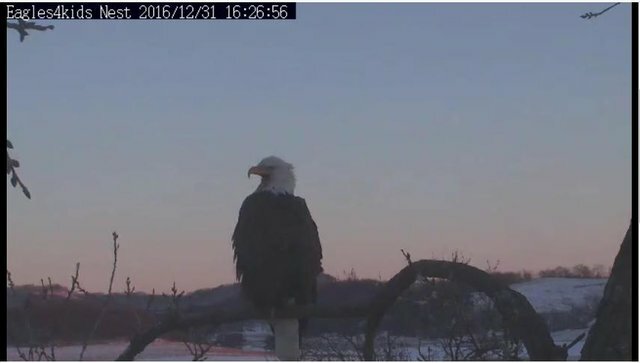 Many of our viewers have been wondering when our eagles will return to the nest. Unfortunately, there are more questions than answers. We do not know the timetable for this pair on when we could expect eggs. Thunder is new to us, and last year with the number of territorial disputes and attacks it pushed Blair and Taylor off their schedule from the season before. Signs pointing in the right direction here would be nesting activity, which ceased since the morning of the raccoon event. I have no reason to believe the raccoon in the nest is the reason for the sudden turnaround. When and if nesting behaviors continue, then we need to give Blair and Thunder time to get in synch and their hormones back on track for a chance of success this season. Keep in mind, last season Blair laid her first egg on March 10th. That was late by all accounts, and one would say that there was a lot more stress on them then, so there is still hope. However, they still came back to the nest and worked unlike what we are witnessing now. I think the eagles have this all figured out, they just don't let us in on it. Why is this happening? I can tell you that there are a number of eagles in the territory of the Eagles4kids nest. 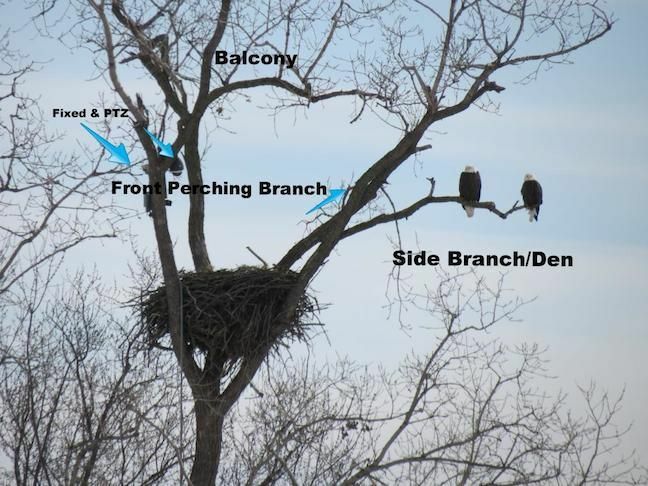 This does not mean that there are not eagles around other local nests. I know there are, however their reason for staying around a bit longer here has to be a food source not far from the nest. Nobody associated with Eagle4kids is responsible for the food source. I can tell you that the food source has been picked up as of last week. However, the damage may be irreversible for this season to be successful. How many times have we said, "Time will tell?" Currently, the eagles in the area may be migrating birds. They are not a real threat. It is the eagles that are likely native to this area, and without a mate that would be of concern. Most are males. They have hormone levels causing them to "act like a bull in a China shop." They can be out of control. If these eagles disperse, and sooner the better, then Blair and Thunder can get back on track and do what they are put here to do. I have no doubt they are a bonded pair as we have witnessed. They have had a full year to get to this point. Notice I am not blaming anyone today. There are plenty to hold responsible, but I will not do that here. If I see posts doing so, they will be deleted. Our classroom is of third graders, eight and nine years old. I teach responsibility, respect, honesty and being safe each and every day. I hold my students accountable, and only hope that the adults reading today's post do the same. Please keep tuning in daily and watch for nesting activity. We will do our best to communicate what might be happening off camera when it is possible. We are not giving up hope! they have only been to tree branch every once in awhile since mid feb19. so this could be the start again. the nest is ready. fingers crossed. have been checking every day. like at so many sites this year, a mystery. have they nested at alternative site and why. She still comes to branch but not to nest bowl. Where is Taylor. is he incubating while sh e is out ???? 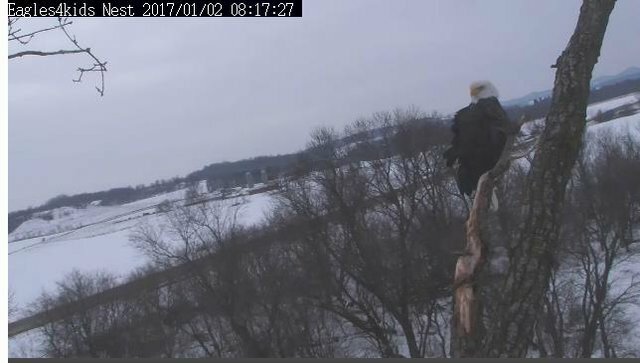 I've been trying to keep up with the going ons here....and some tragic news posted yesterday (6/12)..the nest tree was taken out in a powerful storm. Neither adult was on the nest at the time. I guess this is when I am thankful no babies.